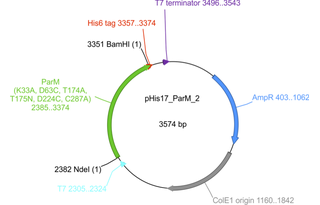 The plasmid is used to express the plasmid segregation protein, ParM, from E. col. 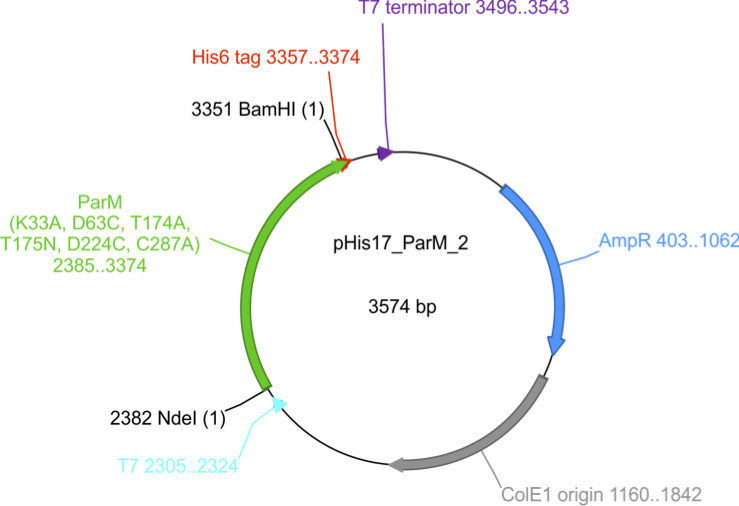 The protein is modified for use as the scaffold of an ADP biosensor, ATR-ParM. Two cysteine mutations are for label attachment (D63C and D224C); there is a mutation to inhibit filament formation (K33A), two mutations to weaken ATP binding (T174A and T175N), a mutation to change the exposed cysteine (C287A) and a C-terminal His6 tag to aid purification. When labelled with two iodoacetamidotetramethylrhodamine (IATR) fluorophores, this biosensor has a fluorescence intensity change of up to 20-fold and can be used to measure ADP in the range of hundreds of nanomolar to ~100 μM, in the presence of up to millimolar ATP. The biosensor can also be used for measurement of other nucleoside diphosphates e.g. GDP, UDP and others.